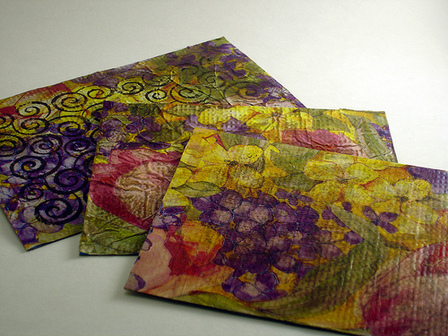 Last time I showed how to make recycled postcards using cereal boxes and crumpled tissue paper. 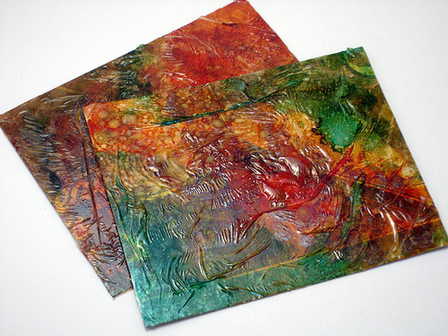 Today I'm taking a cue from these plastic bag prints, using alcohol inks and a plastic bag in a postcard project. Paperboard (like from a cereal box), heavy poster board, or card stock. Adhesive. A Xyron works great for this project. If you're like me and have trouble throwing away possibly-useful things, then you may not even want to read this post. I had a lot more storage room before I realized I could cut up all my cereal boxes and use them for crafty purposes. And I used to only keep the tissue paper that looked nice enough to re-use... now I feel obligated to keep even the stuff the gift recipient crumples up and tosses aside dismissively. So, pack-rats, consider yourselves warned. This may be another thing you'll have to find room for in your "nest." The postcards are made from cereal boxes and recycled tissue paper. Or other stuff (see more suggestions in the materials). And the possibilities are pretty much unlimited. Paperboard. You can recycle this from cereal boxes, soda can boxes, Kleenex boxes, etc. If you don't have those, you could use heavy duty poster board or cardstock. Adhesive. I used decoupage glue (i.e. 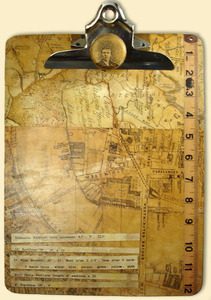 Mod Podge or Crafter's Pick) for my project. A Xyron machine or spray adhesive would also work. I go through the same mini-crisis after every birthday and holiday... what do I do with the cards people sent me? Granted, it's a slightly easier decision if it's just a signature on an unattractive card — to the recycling bin it goes. It seems like there aren't that many that are like that, though. Some have handwritten notes from friends or family members. Some have gorgeous images, or paper I know I could make something out of. Those are the cards that are trouble. Those are the ones that I have piles and piles of in closets and drawers. Just in case I'm not the only one who tends to hoard cards, I thought I'd share a few tips for using these cards in a good, constructive way. 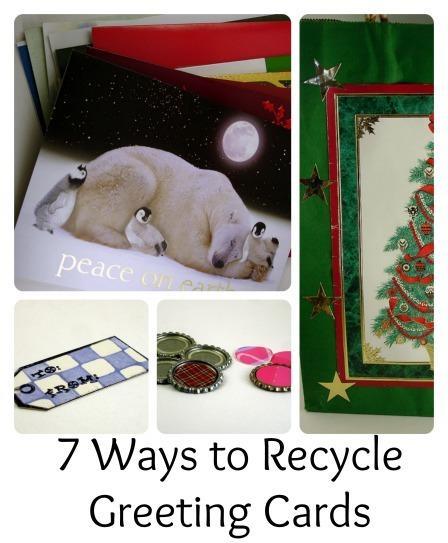 Whether it's Christmas cards, Valentine's Day cards, or note cards, hopefully one of these ideas will help you "upcycle" your old cards into something even better. Still hoping to make your own Christmas cards? 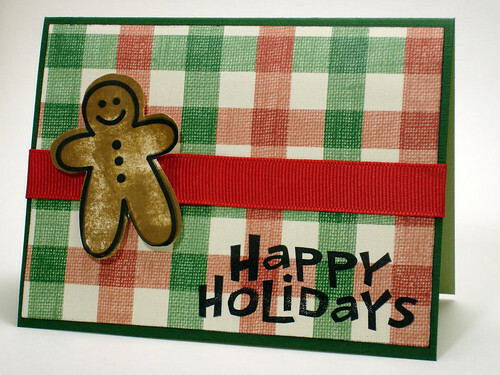 This gingerbread Christmas card is simple to make, but it will be a welcome addition to any friend's mantle. The trick is to spruce up a basic gingerbread outline stamp — or any other outline stamp — by making your own matching background stamp from foam. Cool New Products. A couple I liked were the Fastenations Brads and the Lip Smackin' Ribbon. The Fastenations Brads have a flat spot on top, so you can match them to your project using a standard hole-punch & a dab of glue. The Lip Smackin' Ribbon is kind of a mix between paper and ribbon -- and it has some properties that give it some interesting possibilities. A Few Good Deals: Deluxe Designs is going out of business, so they had a great clearance ($0.50 each!) on those card templates I love. I would have bought them all if they'd had them! And speaking of good deals, I got a $30 voucher for volunteering. With that, I got the 40 Techniques for Making Cards book and a couple of paper crafting magazines. Nothin' better than gettin' stuff for free! 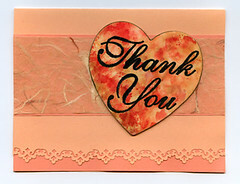 Polka Dot Creations just posted a tutorial I wrote on how to make a "Thank You" card with polymer clay and alcohol inks. Check it out here. While you're there, check out the rest of their tutorials (all free!) here. 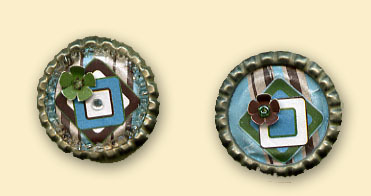 Lisa from Polka Dot Creations has also set up a Flickr group for projects related to the tutorials, so you can see some of my variations there & upload your own. Hope you enjoy! This will probably be a "well, duh" post for most of you -- but I thought I'd share it just in case there's anyone else out there like me. We stopped by my parents' house on the way back from Austin, and I was chatting with my Mom about her scrapbooking supplies. She mentioned a new glue, and I responded that I could use a good glue. Specifically, I complained that when I'd used rubber cement, it would sometimes peel right off. My Dad looked up and said, "Well, it may have changed since I used it, but that used to be one of its purposes." (I hadn't considered that maybe I learned my hesitance to directly contradict someone from my Dad!) He said that back when he used it, putting the rubber cement on one surface made it such that you could peel it off, while putting it on both surfaces made it permanent. When we got home, I looked at my bottle of rubber cement. And what d'ya know? It's right there in the instructions: "Low tack: Apply even coat to one surface and press together immediately. To remove, carefully peel from one edge. Stronger bond: Apply even coat to both surfaces." So I tried it -- and sure enough, that did the trick. The thing is, I'm not the type that's averse to reading instructions -- it's just that I assumed I knew how rubber cement worked. I mean, doesn't everybody...? So thanks to Dad for pointing that out. Wonder what other instructions I need to go read now? 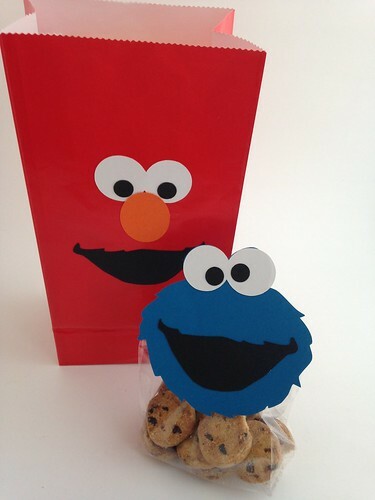 Want to give someone (or yourself!) a nice journal this Christmas? 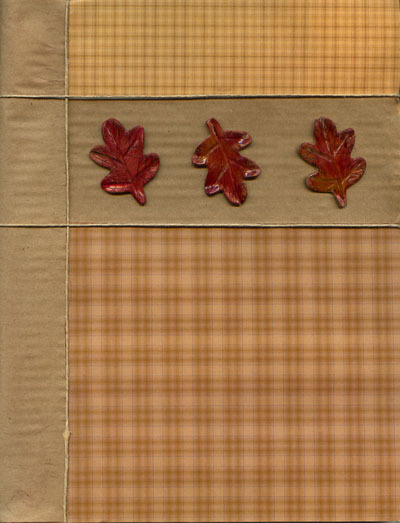 Covering or "altering" composition notebooks is an easy way to make an attractive journal. Just noticed some fun-sounding swaps over at Swap-bot, & thought I'd share them. 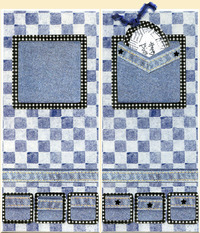 Address Book / Blank Notebook or Journal Swap. Sign up by 11/20/2006. Send by 11/30. Maybe send a decorated composition book...? "Leftover" Holiday Card Swap. Sign up by 11/24. Send by 12/4. A wonderful way to get rid of last season's un-used cards! 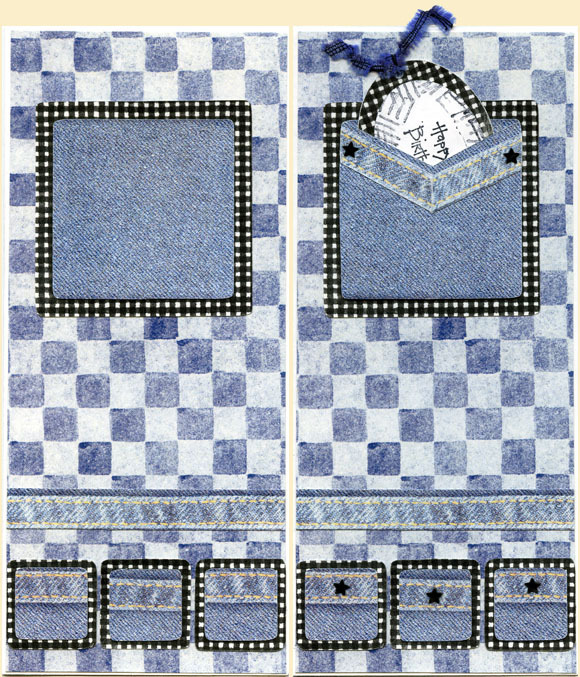 Just Desserts ATCs Swap. Sign up by 11/30. Send by 1/5/07. Desserts are all around us this time of year... at least the Artist Trading Card version is low-fat! Any medium is fine for these ATCs. Christmas Cards Swap. Sign up by 12/1. Send by 12/2. 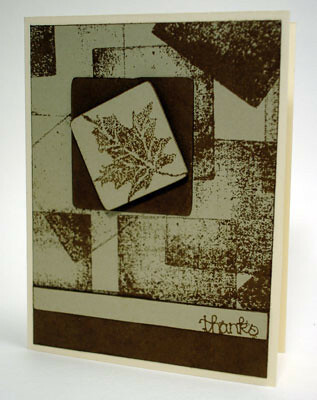 10 store-bought or handmade cards. 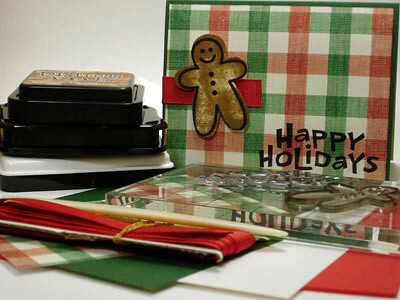 For any of you super-organized folks who have an excess of handmade Christmas cards! 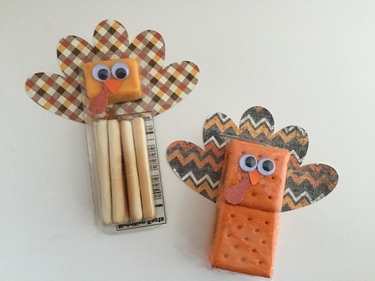 Enjoy whatever crafting you're doing this Thanksgiving holiday! 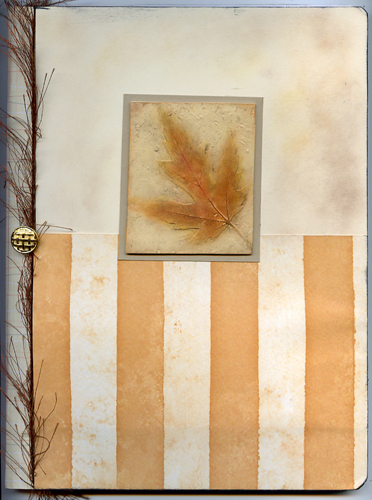 While I'm not much of a scrapbooker, I love this free random layout challenge generator from Creating Keepsakes. You specify the categories (e.g., color combinations, shapes, embellishments, layout sketches, etc.) you want included in your layout challenge -- and they'll generate a random challenge for you. 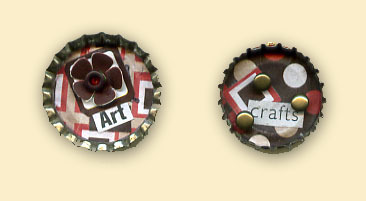 Most of the categories work just as well for cards, ATCs, or other paper crafts. Deluxe Cuts Card Templates are fun little plastic templates for various card layouts. The templates make it a little easier to trace and cut out the paper shapes. Do you have anything special that inspires your creativity? Leave me a comment -- I'd love to hear about it!